Rush Judo coach Salah Rabia, right, being presented with his black-belt by fellow Rush coach Laurie Rush. Rush Judo coach Salah Rabia earned a black-belt and a gold medal after an ippon-infused Southern Area Kyu competition last weekend. Club-mates Carl Walker and Steve Temple were also in Dartford for the contest. All three fought well in hard groups, with Walker and Temple both finishing fifth, just missing out on bronze medals, while Rabia was on fire, winning all five of his rounds by ippon to take the gold. 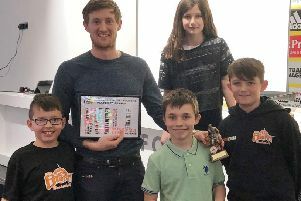 Despite tiredness, he then took part in the afternoon grading and after a further six fights – winning five by ippon – he was awarded the coveted accolade of a judo black-belt. The result was a popular one at the club as Rabia is always in the Berkhamsted dojo coaching juniors and where his young sons also train. Rabia started the sport when growing up in Algeria. He trained sporadically for a few years before stopping when he was aged 15. Meanwhile, in Cardiff at the weekend Rush took a few of their younger fighters to the Dragons competition in Cardiff with gold medals earned for Annis Rabia and Matthew Morley , silver for Jessica Rush, Jemima Cadge, Jacob Berry, Ronnie Berry and Logan McAdam and bronze medals for Jordan Hayes, Travis Hayes and Daisy Connor. Ethan Smith and Mehdi Rabia also fought well and were unlucky not to take medals.